FBI agents are questioning a man they consider a person of interest in the mailing of letters possibly laced with the poison ricin to public officials, according to a source familiar with the case. The agents are questioning a man from New Boston, Texas, whose wife called authorities after she noticed strange material in her refrigerator, and noticed computer searches for ricin, the source said. The source called the development a promising lead in the case. Images obtained exclusively by ABC News of one of the threatening letters sent to New York Mayor Michael Bloomberg show the substance authorities suspect is ricin. 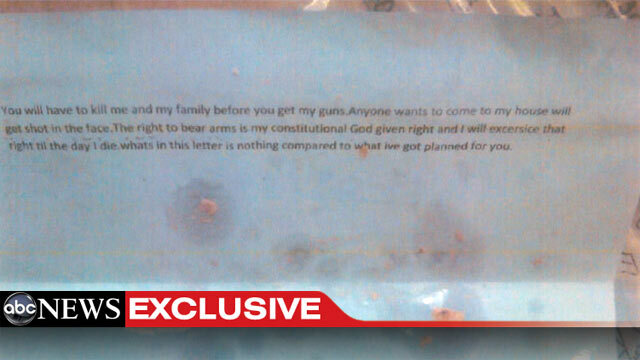 The images show globs of a pinkish, tan substance splattered on a typed letter bearing an anti-gun control message. A similar letter was sent to President Obama at the White House and a Bloomberg-connected office in Washington D.C., police said. The letters never made it to Obama or Bloomberg and today the U.S. Postal Service said none of the letters posed a health risk. 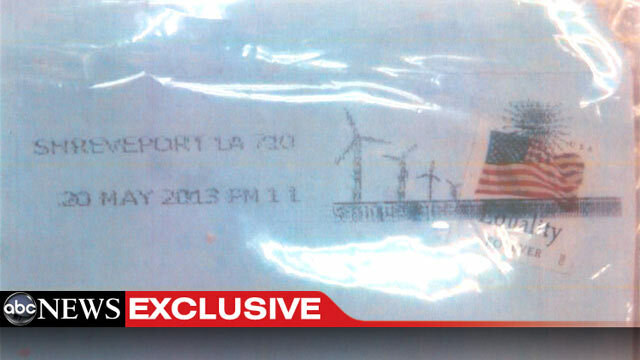 The letters -- all reportedly with identical text -- are postmarked May 20 from Shreveport, La. 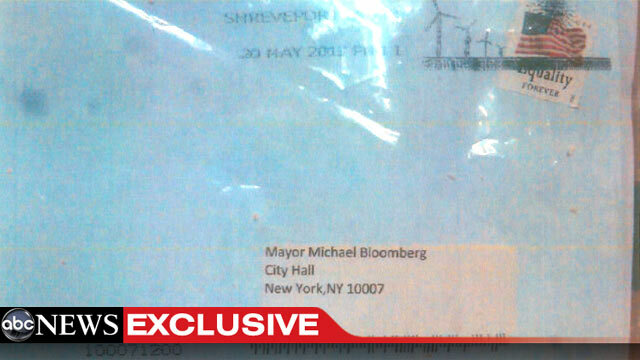 Early this morning, Shreveport Mayor Cedric Glover said his city is working with the FBI and the Joint Terrorism Task Force to "apprehend those responsible for mailing ricin-laced letters to New York Mayor Michael Bloomberg." "We are also taking the necessary steps to protect local [Postal Service] and Government Plaza personnel as well as local citizens from any possible harm," Glover said. Of the two letters to Bloomberg, one was sent to City Hall in Manhattan and the other was dispatched to the director of Bloomberg's organization, Mayors Against Illegal Guns, in D.C.
Two law-enforcement sources told ABC News today that investigators believe the poison-laced letters sent to Bloomberg are the work of an "amateur" because the ricin in the envelopes had such a low level of toxicity. "It may not have been correctly made," one of the sources said. "Clearly amateur hour. This is not the national threat as some are making it out to be." The letter received in Manhattan and the one dispatched to Bloomberg's organization in Washington both tested negative for ricin in so-called "field" tests. But FBI experts view such preliminary analyses as deeply flawed, which is why authorities waited for additional rounds of lab work before going public with news of the letters on Wednesday. At its most dangerous ricin can kill, though it is quite difficult to deliver a dose that intense. The toxin, which comes from castor beans, stops cells from synthesizing proteins so victims can suffer organ failure. Ricin is relatively easy to make with recipe instructions available online. Experts do caution that people trying to concoct the toxin on their own risk poisoning themselves. Bloomberg, a billionaire who has long crusaded for stricter gun control around the country, responded with a flash of defiance. "No, I do not feel threatened," the mayor told reporters Wednesday night. "This was not the first letter that was sent to anybody. In terms of why they did it -- I don't know -- the letter referred to our anti-gun efforts. There are 12,000 [people] that are going to be killed this year with guns and 19,000 are going to commit suicide by guns and we are not going to walk away from those efforts." "I speak for close to 1,000 mayors in the effort against gun violence. This is a scourge against the country and we need to make sure to get this under control," he added. Asked if he was angry, Bloomberg said he wasn't. "There are people that do things that might appear irrational - things that are wrong," he said. "But it's a complex world out there. And you just have to deal with that." One Bloomberg insider told ABC News the mayor himself made the decision to go public with news of the ricin-laced letters as soon as a second, more reliable round of tests returned positive results for the poison. Boston's mayor, Thomas Menino, a co-director at Mayors Against Illegal Guns, said that Bloomberg was "marked because of his position, and my position, on illegal guns." "This is not going to stop us. They can make all the threats they want," Menino said today. Last month, ricin-tainted letters were sent to President Obama and to government offices, including that of Sen. Roger Wicker, R-Miss. The letter addressed to the president was received at the White House mail facility and included the message "To see a wrong and not expose it is to become a silent partner to its continuance." The Senate mail facility received the letter addressed to Wicker. It contained the same message. A ranking counter-terrorism official in New York marveled at how ricin has become so popular among those trying to scare of harm others more than 11 years after anthrax-tainted mail terrified a nation still reeling from the 9/11 attacks. "Instead of the drug of choice, it [ricin] has become the weapon of choice of people who might be thinking that," the official said. One Bloomberg letter was opened by screeners at the City Hall mail facility a few blocks from the building on Gold Street, in Lower Manhattan. Bloomberg's aides said the episode proves the counter-terror measures in place at City Hall worked because no unscreened or suspicious mail gets to the mayor, his staff or anyone else who works in the building – including the press corps. The second letter was sent to Mark Glaze, director of Bloomberg's group, which has its offices in Northwest Washington, near the White House. Glaze actually opened the letter himself on a park bench and then called for help after seeing the powder in the envelope, a source told ABC News. He declined to comment. A D.C. police report obtained by ABC News said Glaze found the envelope to contain "a threatening message which had a whitish orange substance on the note…The letter was addressed to [Glaze] but there was no return address or sender's name."